Russ Chaplin's Driving Instructor Blog: Zombie Pedestrians Invade Our Roads! Zombie Pedestrians Invade Our Roads! It's like I'm scared to turn left sometimes. I swear the problem of distracted walking is getting worse. Driving lessons this week have been an exercise in dodging the texting person walking out in the road without even a glance at what's coming. It's so easy to get involved with a text conversation and that's fine when you're sat in a chair or stood in the middle of a field. When it comes to stepping out in front of moving traffic though it's another case entirely. 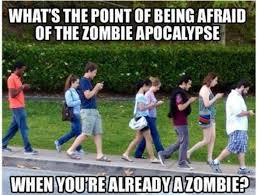 Research from a car insurance firm has shown that a great number of motorists have had to swerve or brake hard to avoid a phone zombie while other drivers have admitted to actually hitting them. There has been a great deal of outcry regarding the use of a mobile phone while behind the wheel of a car and rightly so. Perhaps it's time to have a closer look at how pedestrians can do their part to keep the roads safe and sound. We are all pedestrians some of the time. I had the Green Cross Code drilled into me when I was a youngster. I am not the best in the world at crossing the road but I do at least look and wait if something's coming. My kids think I'm a bit paranoid when it comes to road safety, but rather that than bouncing off a car bonnet and straight into hospital. It's got to the point that my learners are having to brake and check that the pedestrian is going to look and see us before we make a turn. The person just about to step out in front of us is staring at a screen a lot of the time and it makes me nervous. Pedestrians do have a duty of care towards themselves and it can't always be considered as the driver's fault if an accident does happen. It seems the problem is a global one. I read that in New Jersey there are on the spot fines for people caught texting while walking. Could be a good deterrent. Nothing people hate more than losing cash. It's worse than putting yourself in danger to some folk. In China they have installed a walking lane for people who wish to text and walk. The lane next to it is for walking without using a phone and that tends to move much more quickly. The same sort of thing was carried out by the Philadelphia Mayor's Office as an April Fool's day prank. Good way to get the point across I think. What is the point of wandering across the road about 10 yards away from a pedestrian crossing when it's busy? There is no point at all. But if you are staring at your phone you may not realise that the crossing is there let alone the car which is just about to hit you. A couple of times this week I have seen people wearing headphones and jogging down the middle of the road over the hatched markings. Pathetic really and I bet they would blame the driver if they got hit. Time for us all to wake up and put the phone away when we're near the road. The text message can wait and if it can't then just stop, get the text sent and then start walking again. I believe this kind of action would be a major contribution to road safety and you can quote me on that. Seems to be happening everywhere I suppose.